In the country where the Sahara Desert is found it’s unsurprising that gardens are special features. Cities are dotted with them. Mosques are surrounded by them. Giant palm trees, exotic flowering plants and water features star in Morocco’s many gardens. 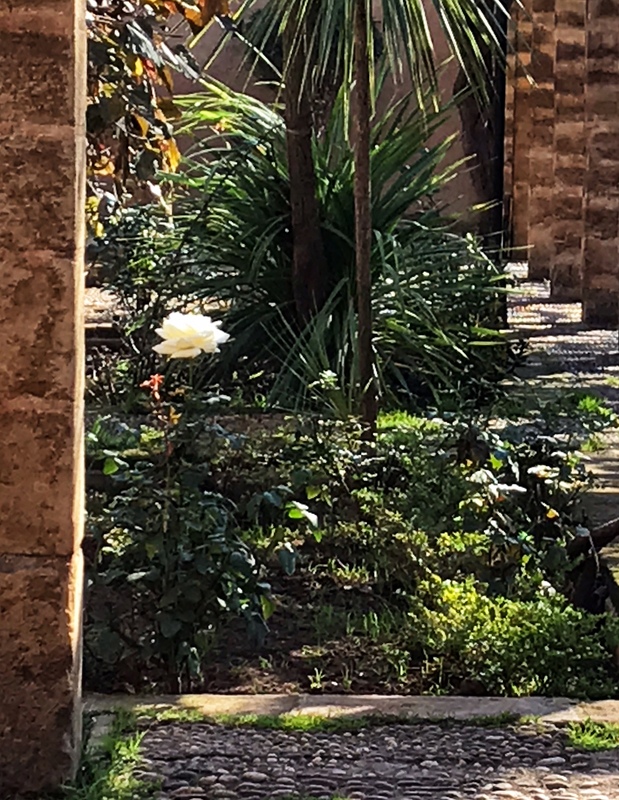 In Rabat on New Year’s Day a physician I’d just met took me on a long walk around Rabat, a walk that included the Kasbah of the Udayas where we found one lone white rose in full bloom. 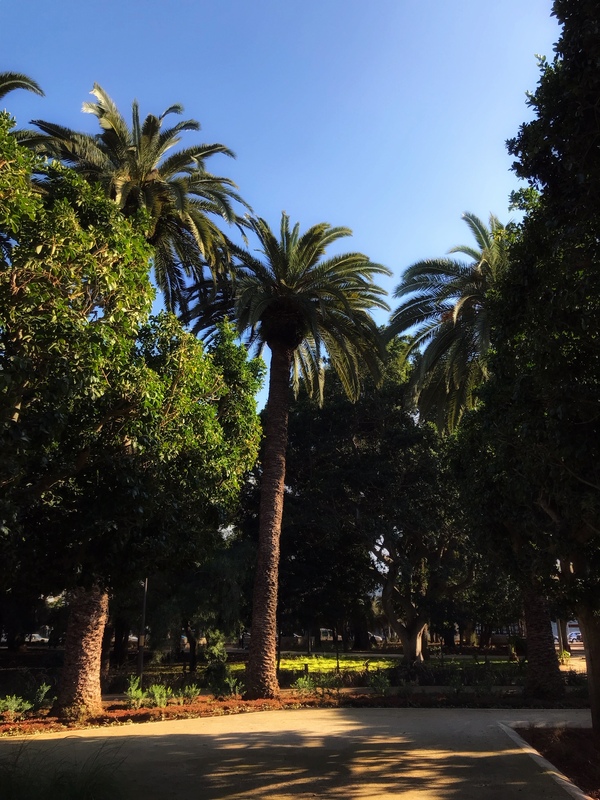 In Rabat a large park named Jardin Nouzhat Hassan, sited on the edge of the medina, quickly became my favorite place. 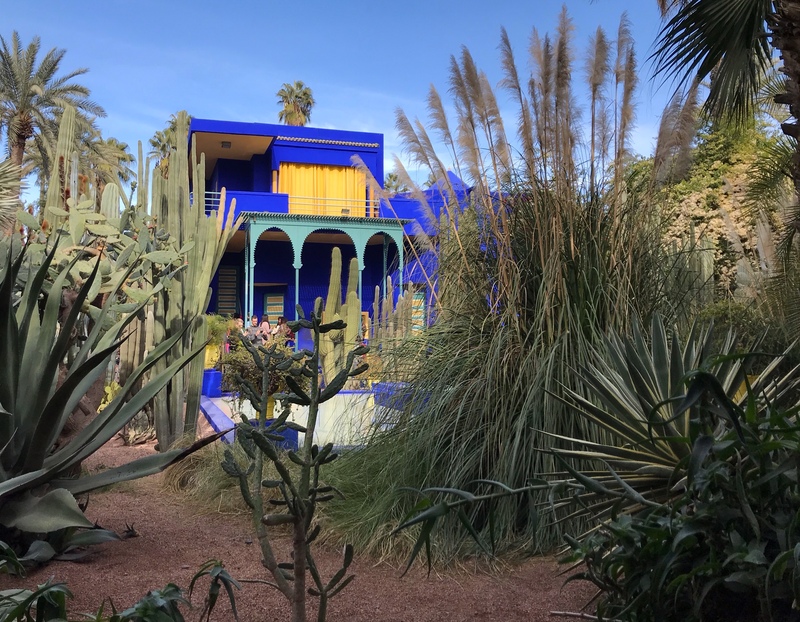 On my first day in Marrakech I stumbled upon Jardin Majorelle, created by French painter Jacques Majorelle and nurtured by him for 40 years. 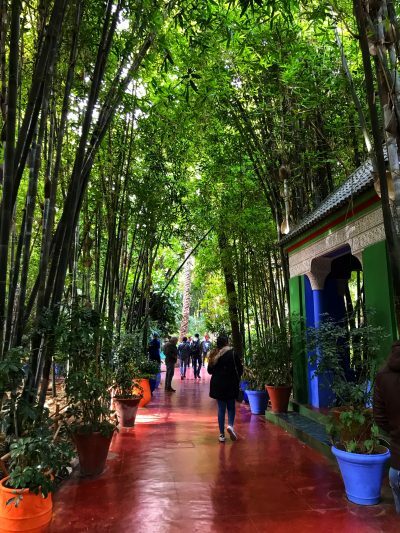 Rescued by the fashion designer, Yves Saint Laurent and his partner Pierre Bergé, the garden today is filled with massive bamboo plants, many-year-old cactus plants, and inanimate objects brightly painted in bold blue and screaming yellow. It is one of the most popular tourist sites in Marrakech. 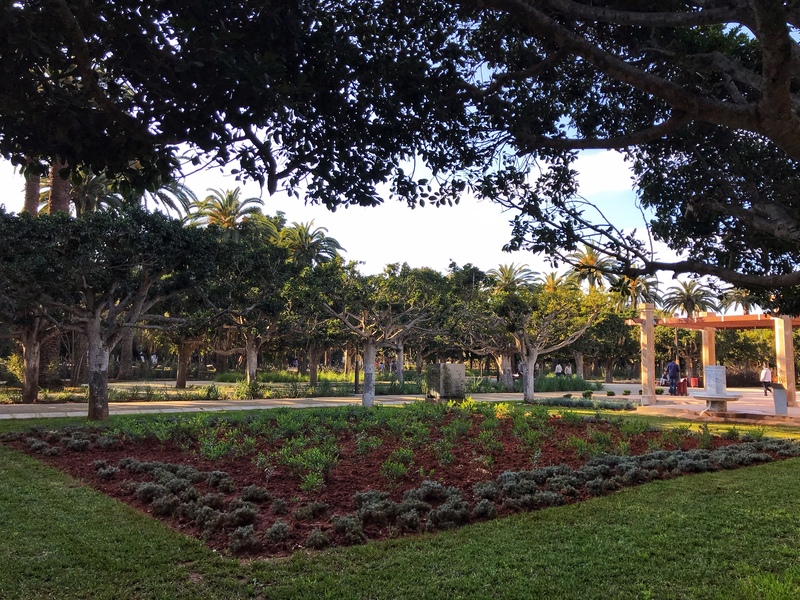 Comprised of several acres of mature plants, paths through the garden and the home of Saint Laurent and Bergé, the garden has also become the memorial to the designer. In addition to the garden there are small museums on the property and an upscale shop. Several small restaurants and café’s are adjacent. The entrance to the garden is lined with enormous, old bamboo. Here you see the Marrakech home of Saint Laurent and Berge. 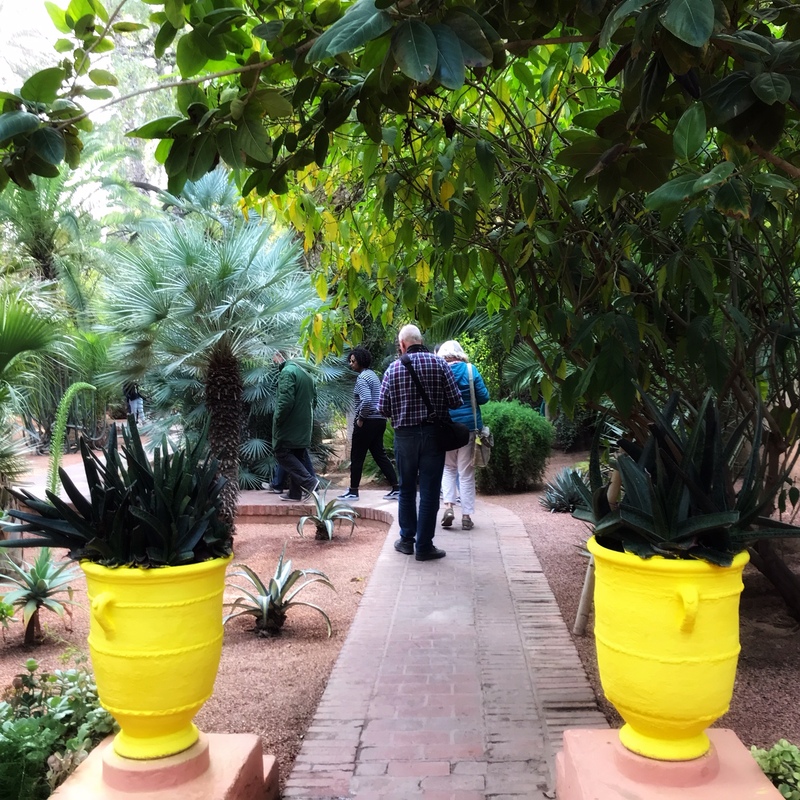 Several other large gardens are found in Marrakech including the Agdal Garden covering of one and a half square miles and featuring a large square man-made pond and a botanical garden. Adjacent to it the Koutoubia Garden ,filled with roses and orange trees, surrounds the most visited mosque and minaret in Marrakech. Inside the medina a beautiful place named Le Jardin Secret [Secret Garden] is popular with visitors. In January the days are short, the flowers are few, and my time was limited. I didn’t get to all these gardens so I’ve given you links to share some images with you. 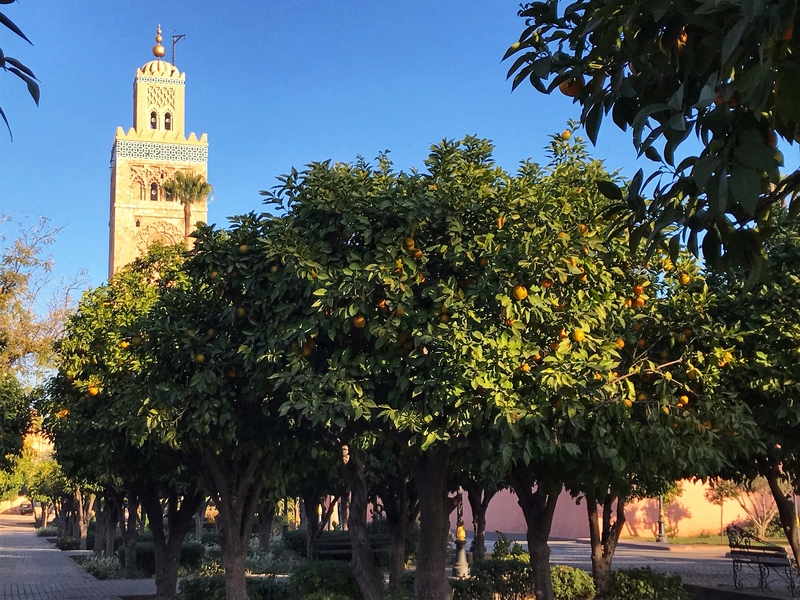 The Koutoubia minaret, surrounded by orange trees. This is my last post about Morocco. Problems with my computer caused me to be unable to blog as I traveled there. Morocco is a very affordable place to visit. Prices of hotels and restaurants and taxi cabs (among other things) were extremely low. French is an official language and most people used it. Moroccans I encountered, mostly in hotels and restaurants, were very pleasant and helpful. Marrakech is rather thrilling: the thousands of zooming vehicles will raise your heart rate! I recommend the Hotel Racine where I stayed in Marrakech (very good value) and the Ibis Rabat Agdal hotel in Rabat (delicious food in the on-premises restaurant). There seemed to be lots of honey-mooning couples in Marrakesh. 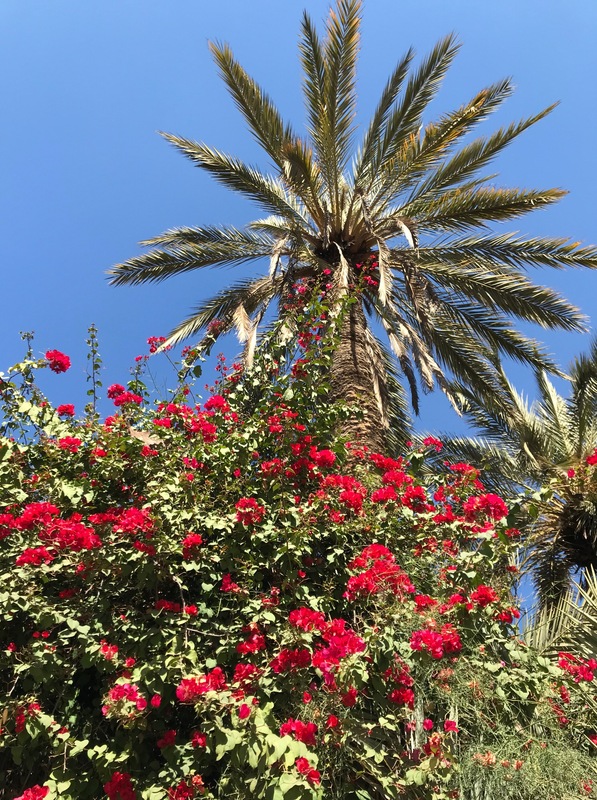 This entry was posted in Gardens, Morocco by Libbie Griffin. Bookmark the permalink.